Hurry! Order Now! Black Friday Sale running till Sunday! will create a cohesive and fulfilling brand experience for consumers who connect via their mobile phone - anytime, anywhere - Makay Simpleaddiction The power of mobile with opencart boosted our bussiness to three fold with customer reorders and giving store a brand value. Seamlessly integration of your online store with the Opencart Mobile App ! Our technical experts will help you start to your bussiness! Multiple currency and multiple language are supported. Supports Cash on Delivery and bank transfer as payment method. Customer can view recent orders made. Show products on sale as multiple listing modes that are clearly visible on all screens. Buyer can remove an item. Create branded native storefront apps on iPhone, iPad and Android ! 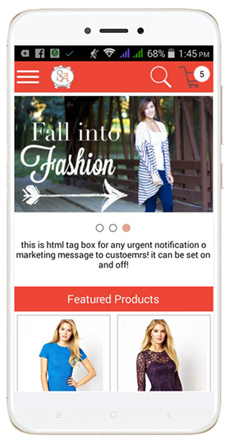 Boost your E-commerce by this APP. The APP gives you vast market users of Android and Apple Devices. 60% increased rate of returning customers due to APP present in their mobile. You can easily customize your APP theme: set your colors, background , logo, banner etc. Market leader and first APP to take Opencart to mobile devices. Kodecube is strongly boosting more flexibility and features in our development lab and are updated to current users. Mobile App supports all opencart localizations including zones, multilanguage, multicurrency. It even remember it for customer. Mobile App gets ready for your store in 20 minutes and just need few new files uploaded. No core file overwritten. It takes your existing opencart configuration and database and yet is fully customizable as independent APP. You don't have to do anything extra to make this APP live. Introductory Sale offer to End Soon! Hurry Up! Seamlessly integration of your online store with the opencart-mobile app ! Kodecube Opencart Mobile App © 2015. All rights reserved. 1. What is this app for? 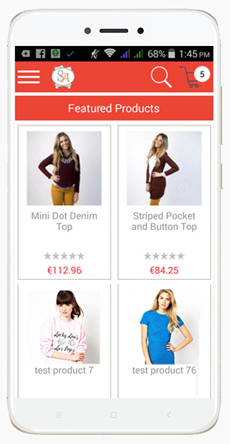 This Mobile App is for shopping sites made in Opencart Opensource. 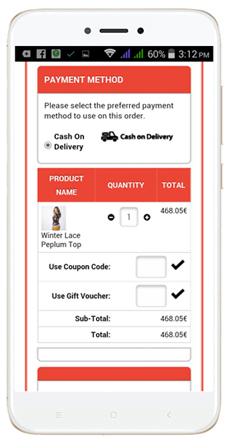 When customers want quick online shopping using mobile, our app solves this demand. 2. What opencart versions it supports? The app supports all opencart version from 1.5.x.x to 2.x.x.x! 3. How can i controll app? Our app is specially made for opencart and has all admin control inside your opencart panel to controll the visibility, colors, icons, filters, banners and features of app! 4. Who is the hosting provider for app code? Hosting is done on your server itself inside opencart directory for faster app performance. App contacts your server directly and our server or any third party server does not come in between which reduce the latency and make your app perform faster. 5. Who upload and install the app on server? We take care of everything regarding app api files and controll panel installation on your server. 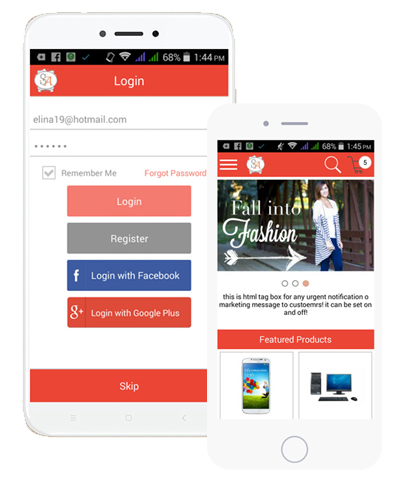 We build the app and upload to android play store and Apple Itunes corporate developer accounts for you. You dont have to do anything to get the app. 6. What do we have to do to maintain app and products? 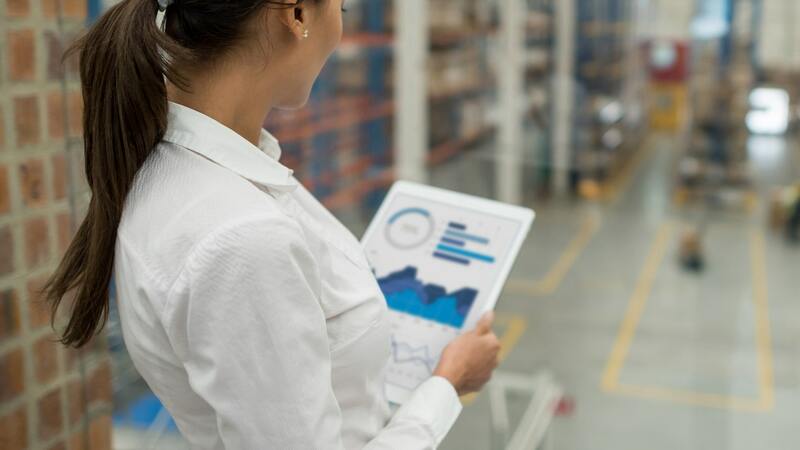 Does it synch with the opencart website? You donot have to do any extra step to maintain the app. The app talks to opencart database in realtime. so the data is synched instantly from opencart to app and app to opencart for every data. You just have to maintain your website as you do now, no extra work. 7. Do we provide source code to buyers? No we donot provide source code to buyers for self customization or development. Yes we give you many standard control features in admin, same are available in video demo which might give you an overview. These settings are required to be done once and can be changed at any point. 9. Support for all payment methods, checkout methods, shipping methods, order total, voucher, coupons etc? Yes we support all payment methods, checkout methods, shipping methods, order total, voucher, coupons by default. Yes we support clickable push notifications. 11. App Renewal and fees. There is app renewal fee each year if you buy Regular License! If you purchase a lifetime license you donot have any renewal fees! Yes the app has been tested and supports RTL. 13. How do we translate APP to other multilanguages? Just like opencart we have language files in different languages folder. Just translate it and your app is now multilanguage. 14. Layout/ Design or extra customizations! For color changes we have given you many controlls in opencart admin. FOr design changes you can raise a custom requirement enquiry and we would get back to you within 48 hours. The APP is native!, not a template container. Each design is made in java. We support extra customization but since opencart app development is time consuming we entertain a minimum development ticket of 1000$ at 15$/hour app development charge. For Webservice Customization (PHP Server Code) there is no minimum ticket and we take custom work at 15$/hour. Please email us to know if the customization you seek is a webservice customization or app customization! 15. Does opencartmobileapp.com controll your app for any limitations? No, we leave the app directly in your controll , there is no limitation on number of products, orders or customers. Its speaks to your server directly. 16. To release app in your own personal developers account. You get the app made with complete your branding like banner, logos, app name etc. we donot market our name anywhere inside app, its completely your brand.